I just bought this santa dress with matching doll outfit for my daughter. I am DYING! Both pieces were under $21. Come on now! What a steal. I can’t believe it – but this is the first time in my LIFE that I am all caught up with holiday shopping. 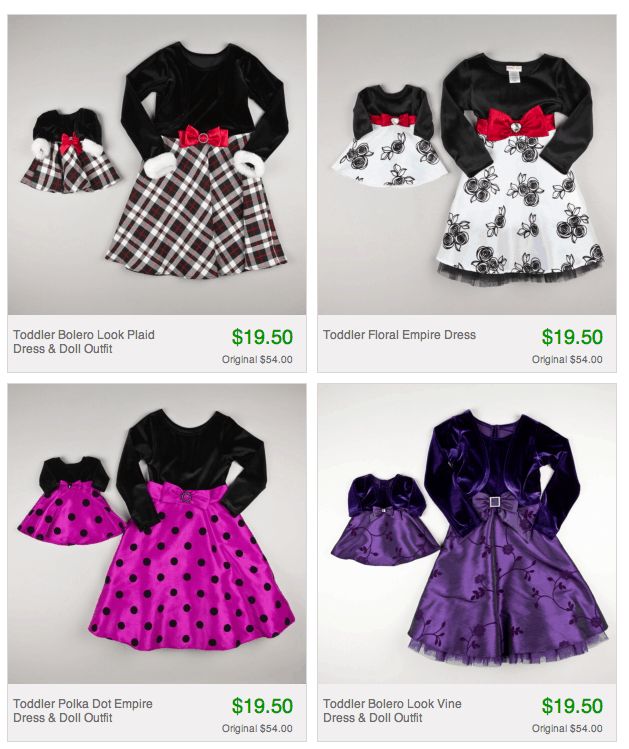 I’ve purchased several holiday looks (for class play, Christmas Eve, Christmas Day, Santa Breakfast) and Natalie’s Thanksgiving dress all from Totsy over the last few weeks. Click here to see the rest of the styles that are available. They are DARLING! And as always, Totsy is a flash sale site that is free to join and offers new sales every few days. Just look at the discounts on these pieces. SO WORTH A LOOK! I know you have posted about this site before, but I have never checked it out. I think I need to be mad at you know. They have the coolest stuff on there!!! My wallet is going to suffer. It’s always quite sad to see things like this sold so cheaply when you know that someone somewhere is working their fingers to the bone for no money so that retailers can sell the stuff so cheaply. It’s not really much of a steal when someone has had to pay so dearly for it. When you look at something like this and think about fabric costs and time to make it does it make you wonder how on earth it can be so cheap! ?